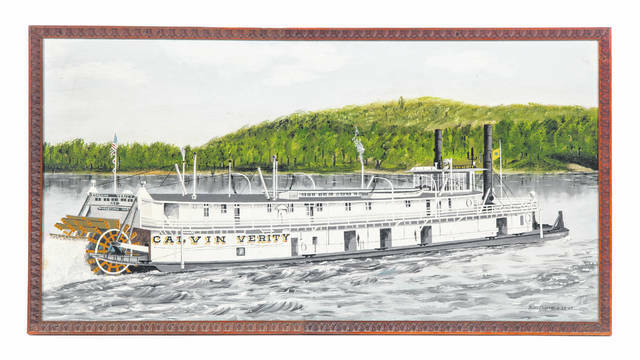 Pictured is an image of the Calvin Verity riverboat. At the Tuesday, Aug. 7 meeting of the Delaware County Genealogical Society, Jeff Spear, president of the Sons and Daughters of Pioneer Rivermen, will present the history of Marietta, the Ohio River, and the steamboats that plied the waters. The presentation will cover the riverboats that worked the Ohio River from the mid-19th century through the later 20th century. Spear will discuss facts about the boats and the people that worked on them – yesterday and today. Spear has traveled many rivers, lakes, and seas on a variety of vessels, and he will share his experiences and “tales.” He has been a major driving force in amassing the collection at the Ohio River Museum. Spear also proudly takes an active role in the annual convention of the Sons and Daughters of Pioneer Rivermen to be held in Marietta on Sept. 14-15. The group will be celebrating the 100th anniversary of the building of the W. P. Snyder, Jr. steam sternwheel towboat. The DCGS program is open to the public and free of charge. It will be held at 7:30 p.m. on Tuesday, Aug.7t in the Community Room of the Delaware County District Library, 84 E. Winter St, Delaware. For more information, call 740-369-4375 or email dcgenealogysociety@gmail.com.